The American Massage Therapy Association (AMTA) recently announced strategic investments in other key massage organizations that affirm the strongest organizational alignment that field has seen for two decades. With AMTA’s growing membership – up 50% in 5 years – the not-for-profit that has for years fueled the field’s research arm has now stoked activity in its accreditation and educator organizations. Word of AMTA’s recent beneficence arrived through the newsletter of the Alliance of Massage Therapy Education (AFMTE). The under-funded, volunteer-driven organization has worked diligently for years to strengthen the educators who serve as massage school faculty. AFMTE’s National Teacher Education Standards Process began by establishing competency standards for teachers. The overall goal of the 5-step project is transformational: create a culture of teaching excellence in the massage field. AMTA granted AFMTE $75,000 over two years to advance the standards project. The grant was a positive surprise. For many years – despite that fact that independent educator organizations are key legs on which professions stand – AMTA acted as if AFMTE was a competitor to AMTA’s own programs for its school members. AFMTE’s president Stan Dawson, DC, LMBT thanked AMTA for the investment. He confirmed that it was AMTA’s first support of the educator group. Dawson says AFMTE projects that the program will become self-supporting. Dawson shared additional news of a change in AMTA granting patterns. 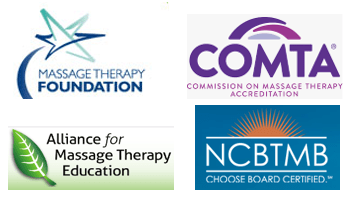 For the more than two decades of its work as the accrediting leg of professional maturation, the leaders of the Commission on Massage Therapy Accreditation (COMTA) have similarly struggled to secure resources to advance their mission. AMTA has not in the past pushed the importance of specialty accreditation for the massage field. COMTA has struggled, attracting only 70-90 schools from over massage programs. AMTA granted COMTA $200,000. The funds are for a “a new scholarship program for schools that will help schools who might have wanted to achieve Accreditation but previously weren’t able to because of the expense.” The numbers of COMTA-accredited schools is anticipated to rise. AMTA continues as the Massage Therapy Foundation’s primary donor with contributions reaching $550,000 last year. AMTA is a key sponsor of the MTF’s 2019 International Massage Therapy Research Conference. It now offers free student memberships and free registration of school members in its annual Schools Summit. AMTA has helped a third leg of massage professional development via operational support for the National Certification Board for Therapeutic Massage and Bodywork. Since 2013, AMTA has given away some $250,000 in student scholarships. In the past year, AMTA provided 100,000 hours of free continuing education. In fact, AMTA let a couple of those cornerstones – COMTA and then AFMTE – sag over much of the past two decades. Now that has changed, hopefully into the future. This is an impressive portrait of growth since Brown took AMTA’s helm five years ago. And with these strategic moves, more power to AMTA and exceptional news for the massage profession. All bode well for strengthening the appropriate integration of massage into US health care.